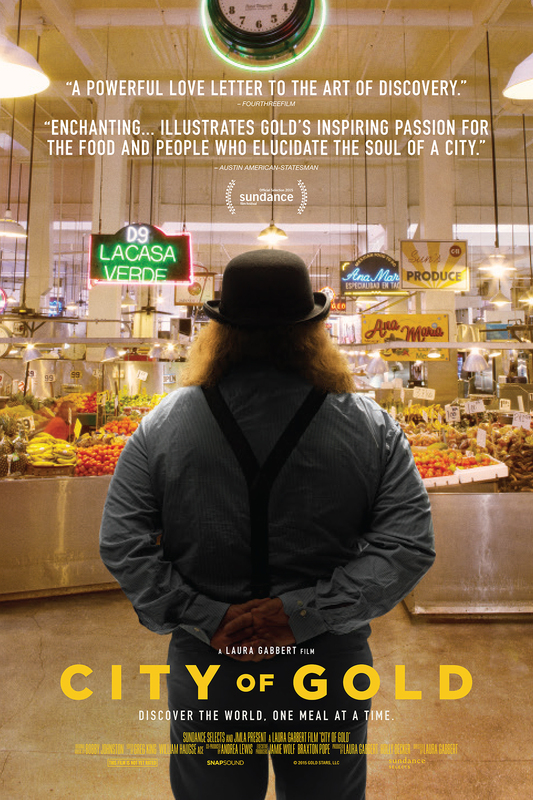 We’re celebrating the upcoming release of the documentary “City of Gold”, about the culinary landscape of Los Angeles as seen through the eyes of Jonathan Gold, our favorite Pulitzer Prize-winning culinary geographer who has redefined the art of the meal and the joy of food criticism. Throughout his tenure at the Los Angeles Times, LA Weekly and Gourmet, along with his contributions to KCRW’s Good Food, Gold has exposed food lovers across Los Angeles to local jewels — the many exquisite kitchens and restaurants that are often tucked away, far from the beaten path, where master chefs turn their cuisine into culinary feasts as well as a cultural events. As Gold’s writings transport us, director Laura Gabbert brings his palate to life. Her Sundance-selected documentary “City of Gold” is a gastronomic treat and travelogue with Jonathan Gold as he combs through colorful neighborhoods in his green pickup truck, sniffing out his next strip-mall discovery — Oaxacan grasshopper soup, hand-cut tonkotsu ramen, and a particularly unctuous pad see ew. Our City of Gold Box puts the pickup truck at your fingertips as it reaches for the critic’s most cherished, authentic and ethnic food discoveries. You’ll enjoy recipes and ingredients to cook Black Bean Soup with Coriander Cream with an Oaxacan mole sauce from Guelaguetza, Roy Choi’s Kogi Dogs, Pad Thai with a sauce from Ayara Thai, a Sechuan rice bowl, and Ludo Lefebre’s Roasted Carrot Salad. Enjoy the trailer to City of Gold! Your box will contain special ingredients that let you bring the rich culinary scene of Los Angeles into your kitchen, featuring recipes from the chefs and restaurants celebrated in this film. From Mole Sauce created at Guelaguetza Restaurant, to Pad Thai Sauce from Ayara Thai, and Brassica and Brine Kimchi, this box features a particularly diverse array of ingredients to enhance your meals.